The old, dead cedar tree leaning precariously toward electrical wires needed to go. 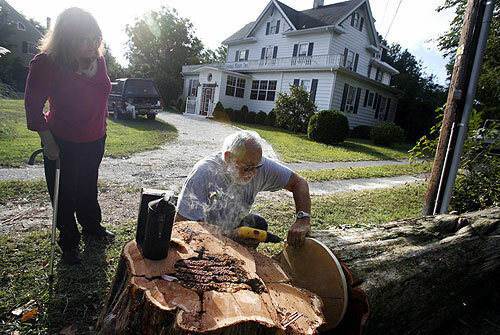 Linda Nicola hired a tree removal service for the job next to her bed and breakfast in this Eastern Shore town. But workers discovered the hollow tree was actually a busy community of thousands. Wild honey bees and a 2-inch thick honey comb covered 6 feet of the inside wall along with quarts and quarts of all-natural honey. Nicola, who moved with her mother from California San Fernando Valley this summer to Colonial Manor Inn on Market Street, said everybody was amazed when they saw the tree mass of bee condos. Paul Young, a local beekeeper, said he was struck more by the health of the bees and at how docile they were. "The colony is huge and thriving", Young said." We're so excited because this is a true, wild bee hive". Bee colonies have dwindled in Virginia and elsewhere. A wild bee disease, thought to be caused by a virus has destroyed about 80 percent of the hives in many northern states, Young said. Nicola, an animal lover, realized that bees fell in that same category for her. "They're not exactly animals, but I know they're really struggling", she said. "They couldn't just call somebody in to kill them". Those involved in the rescue effort consider her a hero. She agreed to foot the bill "about $1,000 “ to have the bees and their cedar log home relocated to beekeeper Young's spread, more than 10 miles north in Parksley. By 9 a.m. Wednesday, while the bees were still sleepy, machines, workers, and the curious hovered in Nicola's side yard. The bee complex, sawed into a single log the length of the hive, was lifted onto a special truck and secured. Both ends were sealed. Some bees and several pounds of honey had to stay behind in the stump at Nicola's inn. The insects, however, seemed to sense their home was in peril and got busy moving their food stash from stump to log. But Nicola still was spooning golden honey from the stump long after the hive was gone. "The move was an excellent idea to preserve the bee colony", said George Waldenmaier, a high school biology teacher on the Shore who collects stinging insects for a pharmaceutical company that makes allergy medications. "The health of these insects obviously means a good, healthy queen with good genetics", he said. That was a likely place for a hive that size, plenty of flowers and trees, clover in the yards, little insecticide. At Young's poultry farm, the log was set upright in a grove of trees, near fields. Young pointed at the worker bees, climbing in and out of an access hole in the log . "They're interesting creatures", he said. Only about 5 percent of the insects hatched are male. Their sole purpose in life is to fertilize the queen. They don't even feed themselves. Female workers feed them. The queen is treated as such. She does little but provide the colony with new members. "The workers, literally, work themselves to death", Young said. "They have nurses, undertakers, housekeepers. They collect pollen all day, go home, clean and build the comb all night. They live only a short time." They were busy Wednesday afternoon, getting used to a new environment and making certain their winter food supply was safe. And the whole relocation process went off without a single sting.